Heat oven to 350°F. Spray 11x7-inch (2-quart) glass baking dish with cooking spray. 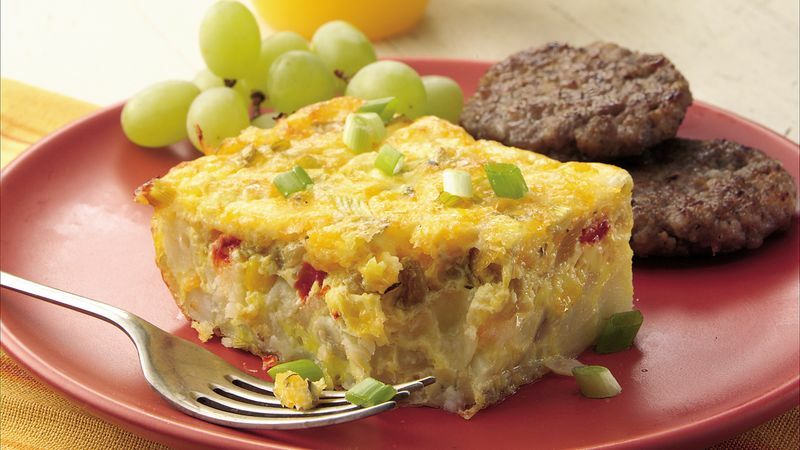 In baking dish, layer potatoes, corn, bell peppers, chiles and 1 cup of the shredded cheese. In medium bowl, beat eggs, cottage cheese, oregano and garlic powder with wire whisk until well blended. Slowly pour over potato mixture. Sprinkle with onions and remaining 1/2 cup cheese. Cover with foil; bake 30 minutes. Uncover; bake about 30 minutes longer or until knife inserted in center comes out clean. Let stand 5 to 10 minutes before cutting. Save on last-minute fussing by assembling this brunch dish a day ahead. Cover and refrigerate, then bake as directed.